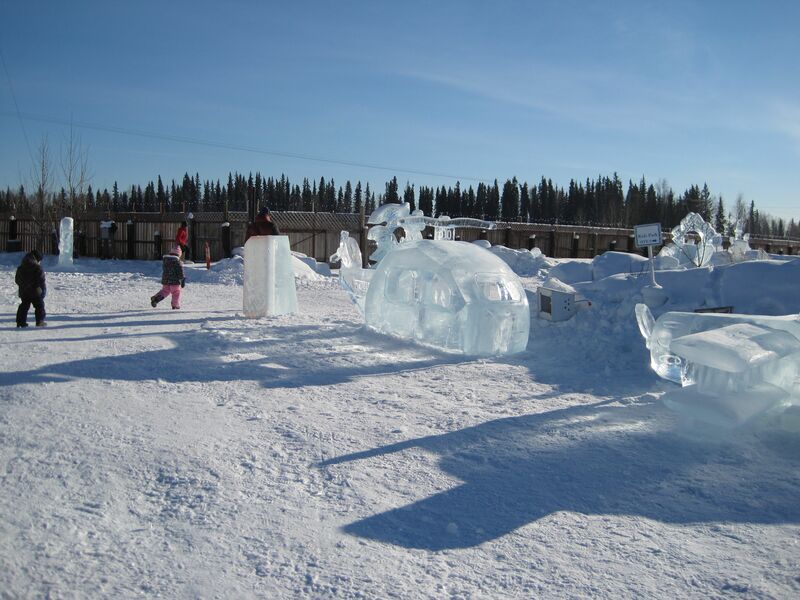 Each year, from late February through most of March, IceAlaska hosts a kids’ park (ice slides, climb-on ice sculptures, ice mazes and skating rinks.) 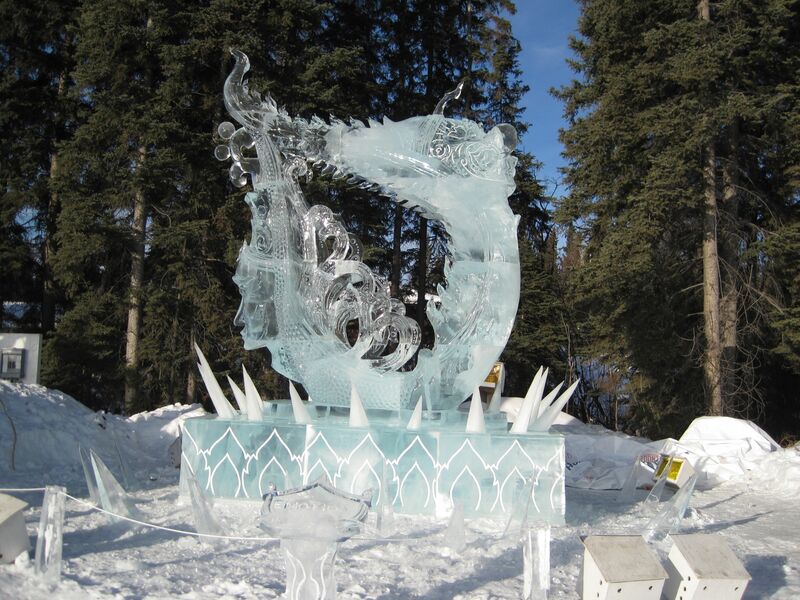 The same venue plays host to the BP World Ice Art Championships. These slide shows display the 2014 competition pieces. 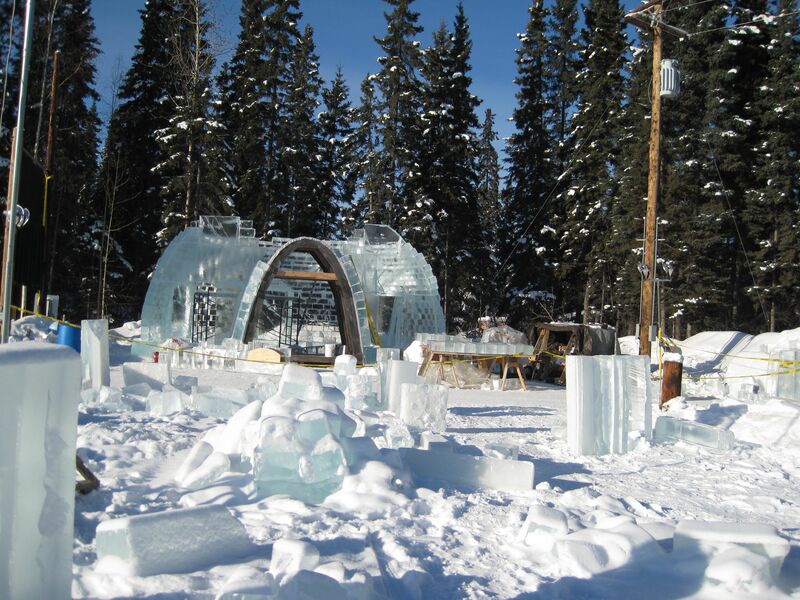 The Single Block competition gives teams of 1 or 2 people a single block of “Alaska Diamond” ice, roughly 8′ x 5′ x 3′ harvested from O’Grady Pond Too. Heavy equipment is used only for the initial placement of the block. Power tools may be used, and the teams are allowed 2 1/2 days to work. 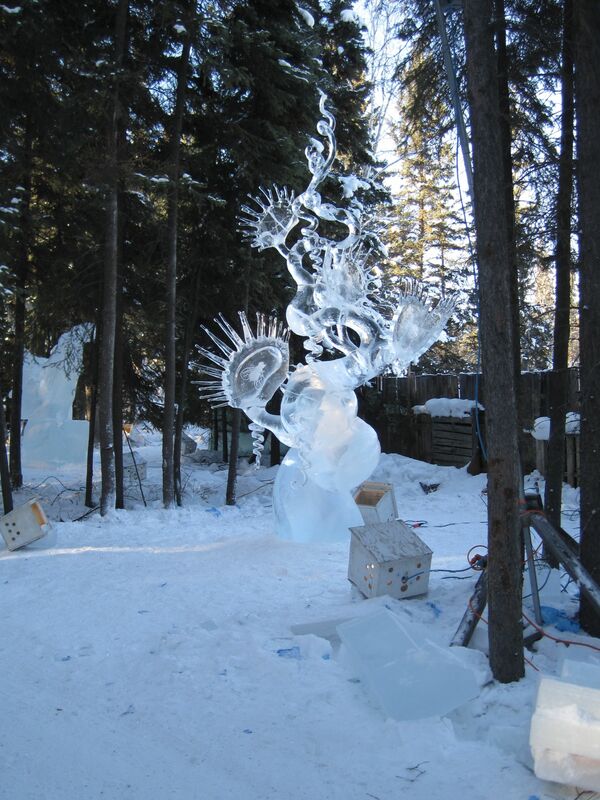 Only the ice, ice shavings, and water (as glue) may be part of the finished sculpture. 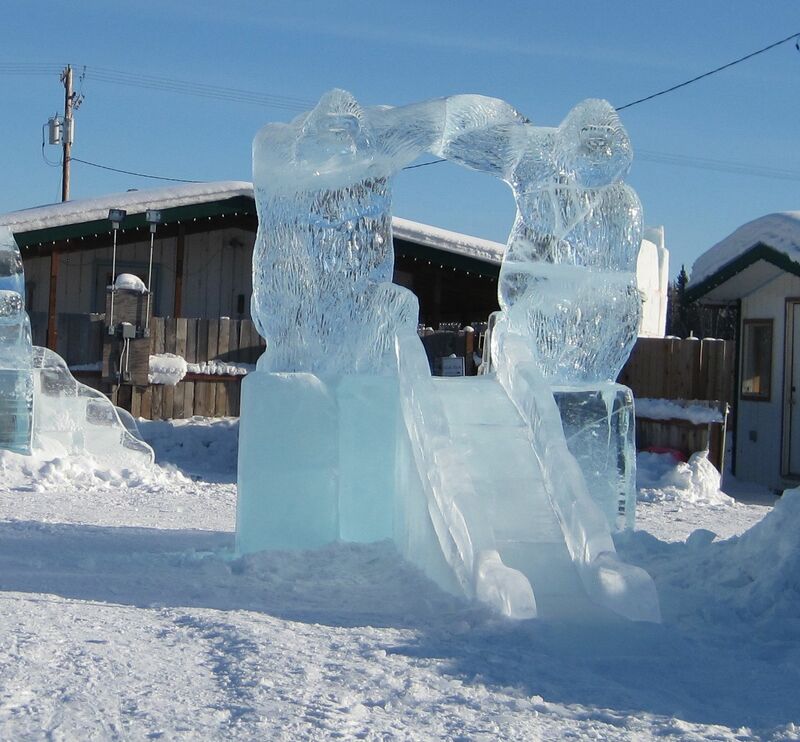 The Multi-Block competition gives teams of up to 4 people 10 blocks of ice, each roughly 6′ x 4′ x 3′. (The 3′ in each case may vary; it’s the thickness of the pond ice.) 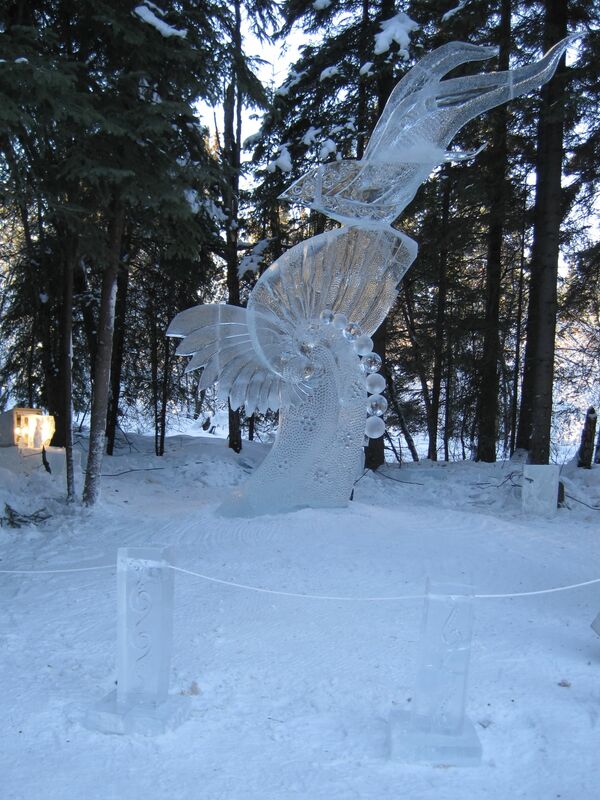 Heavy equipment and skilled operators are available to move and stack carved and uncarved ice. The teams have 5 1/2 days to work. 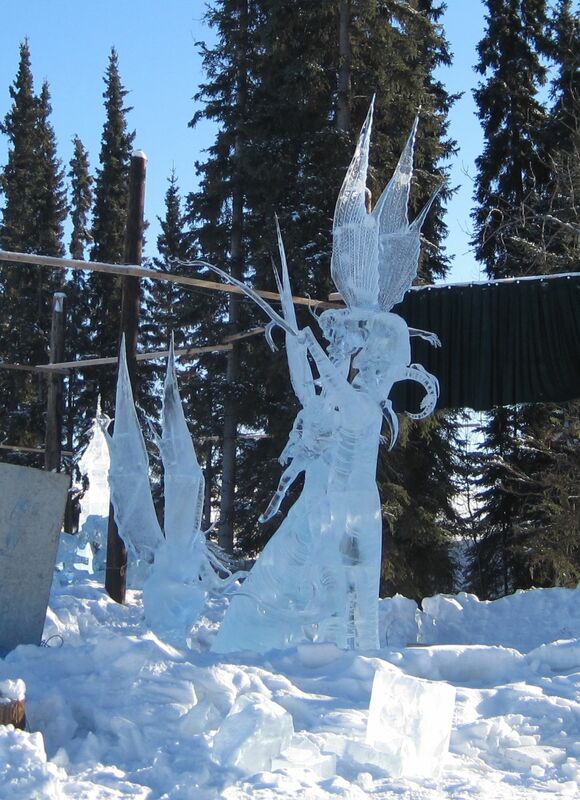 These are the second and third place multi-block winners at the World Ice Art Championships. Second Pace Realistic: Soul of the Moon. Sculptors Jinichi Nakamura, Japan; Shinichi Sawamura, Japan, Todd Dawson, and Ara Hidenobu, Japan. Second Place Abstract and Artist’s Choice award: Gone With The Wind. Sculptors Ivan Zuev, Russia; Eduard Ponomarenki, Russia; Aleksei Tugarinov, Russia and Julio Martinez, Mexico. Third Place Realistic and Artists’ Choice Award: Adventure Book. Sculptors Tsagaan Munkh-Erdene, Altankhuu Khishigdalai, and Enkherdene Ganbataar, all from Mongolia. Third Place Abstract: Emotion. Sculptors Manu Spmgsro, Sithichai Sutapan and Anusorn Sjongsri, all from Thailand. The sun will rise this morning at 8:02, and set 11 hours 57 minutes later at 7:52 this evening. Since we’re now gaining 6 min 43 seconds a day, by tomorrow we’ll have more day than night. But the equinox won’t be until 8:57 am Thursday the 20th! Why do we have equal day and night lengths before the equinox? At the risk of sounding like a broken record, I’ll explain again. The equinox is defined by true sunrise and sunset, when the center of the sun would line up exactly with the horizon if light rays traveled in straight lines and your eyes were right on the ground. None of these assumptions are true. In the first place, sunrise and sunset are defined by the first (and last) appearance of the top edge of the sun. At the equator, this differs by about a minute from the time as defined by the center of the sun. Where I live it is closer to 2 minutes. The position of your eye doesn’t matter much normally, but I’ve seen the midnight sun (not normally visible at Fairbanks) from a small plane. Finally, the atmosphere bends light, especially near sunrise and sunset. Exactly how much depends on the density structure of the atmosphere, which up here tends to produce a lot of bending. The numbers above are based on a standard atmosphere, so it is possible that the day length today is even longer than calculated. At any rate, it is beginning to feel like spring. 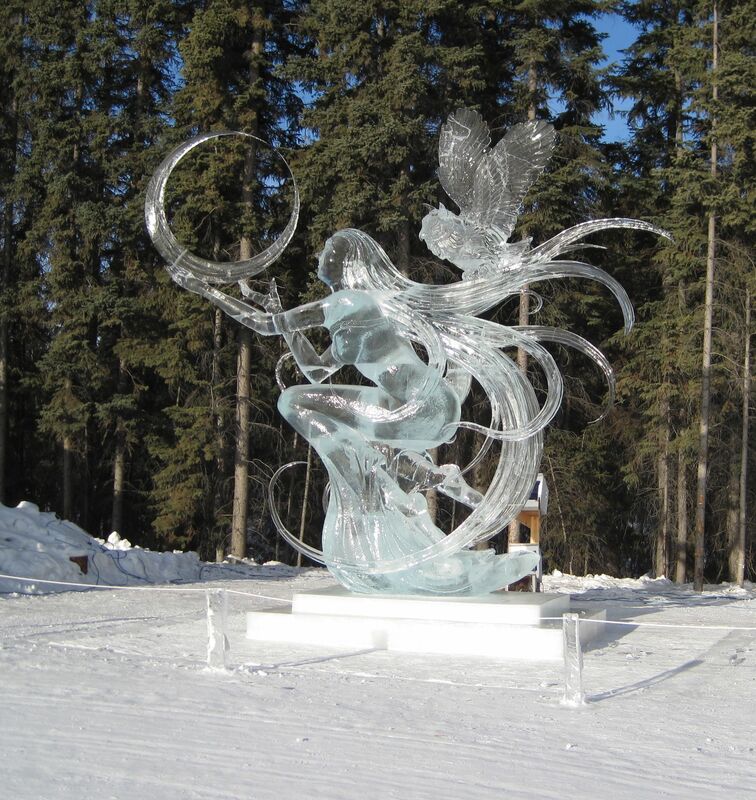 We had several thawing days last week, and I am sorry to say that some of the ice sculptures are beginning to melt, especially those with delicate parts. I went out again Friday to get some photos with the sun in a better position, and found a group of school buses unloading children! Luckily most were far more interested in the slides than the sculptures, so I was able to get some good shots. Some still looked pristine; some were slightly melted; some were partly collapsed. Here’s a pair of photos showing some of the damage wrought by the warm weather. Both photos are of “Guardian of the Deep” sculpted by Chris Foltz, Dean Murray, Jillian Howell and Amela Rombach, all of the USA. 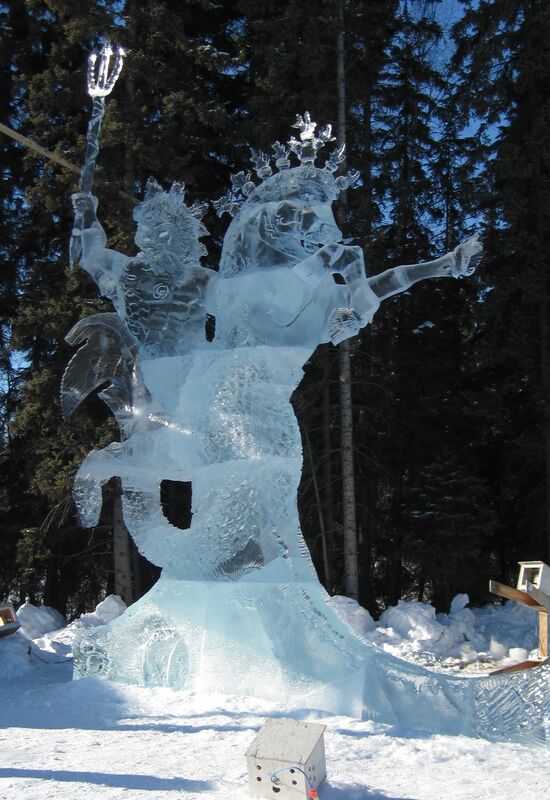 If you compare the two, you can see that Neptune has lost his trident, and the seahorse has lost a hoof and part of his mane. Final comment: the warm weather seems to have ended. The coming week is forecast to be about normal: partly cloudy, no precipitation, highs in the 20’s and lows zero or a little below. 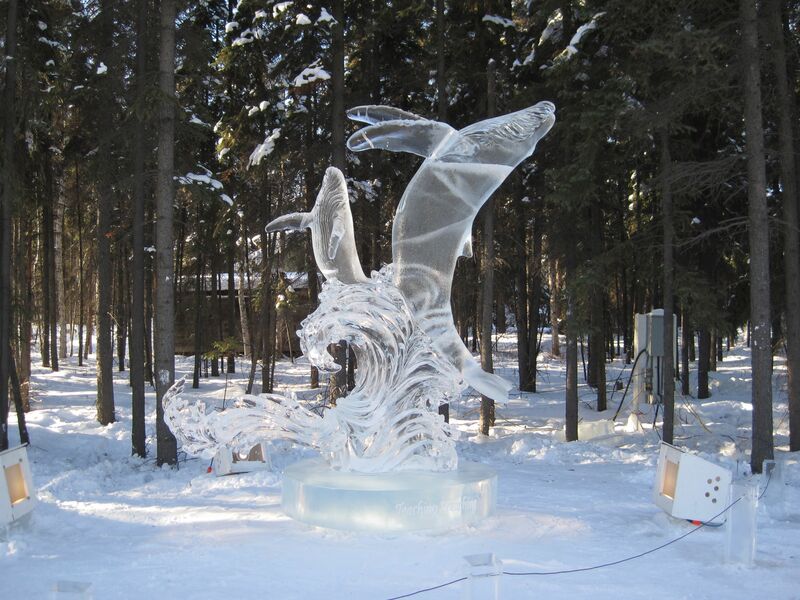 Here’s the first place abstract in the multi-block competition in this year’s World Ice Art Championship. 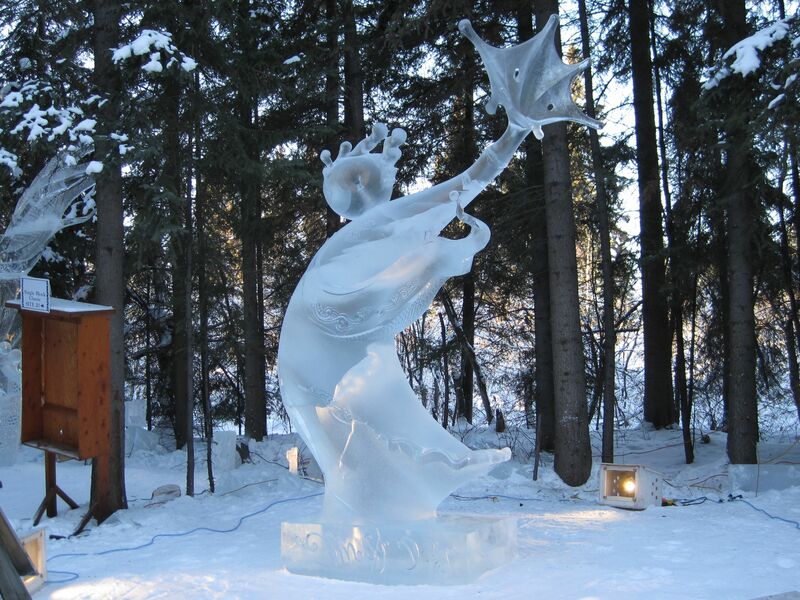 Sculptors are Vitally Lednev, Russia; Marlo Amegee, Monaco, Robert Sparks, USA and Bradley Groszkiewicz, USA. And first place in the realistic category. 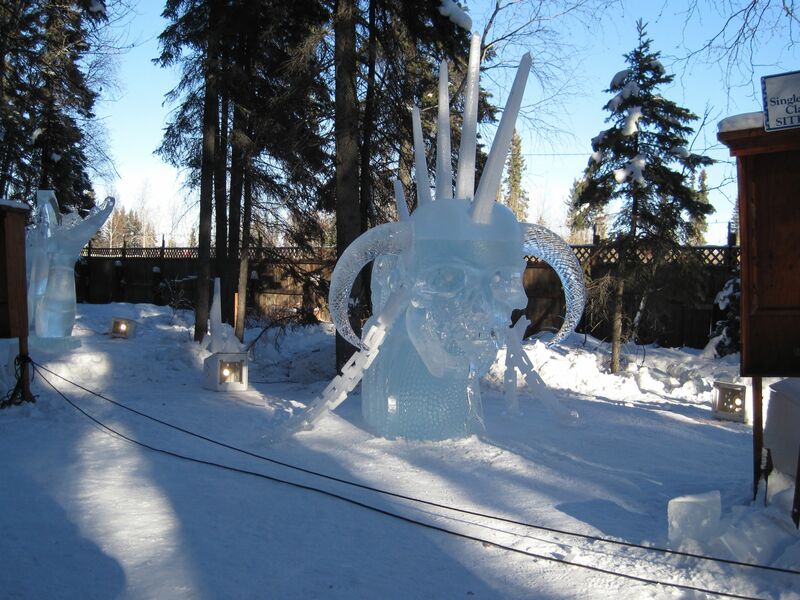 Sculptors are: Victor Dagatan, James Duggan, Jess Parrish and Angelito Baban, all from the USA. 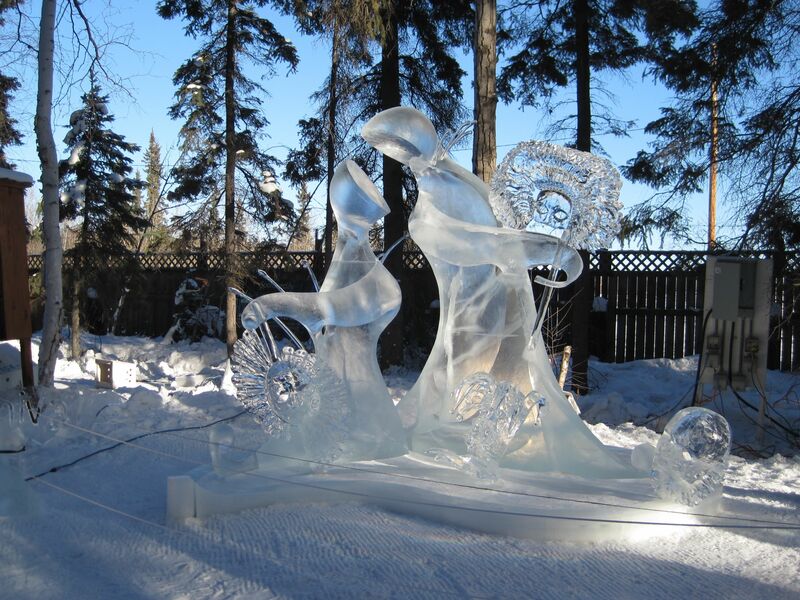 4th Place Realistic was Fairy Tale, sculptors Junichi Nakamura and Hidenobu Ara, from Japan. 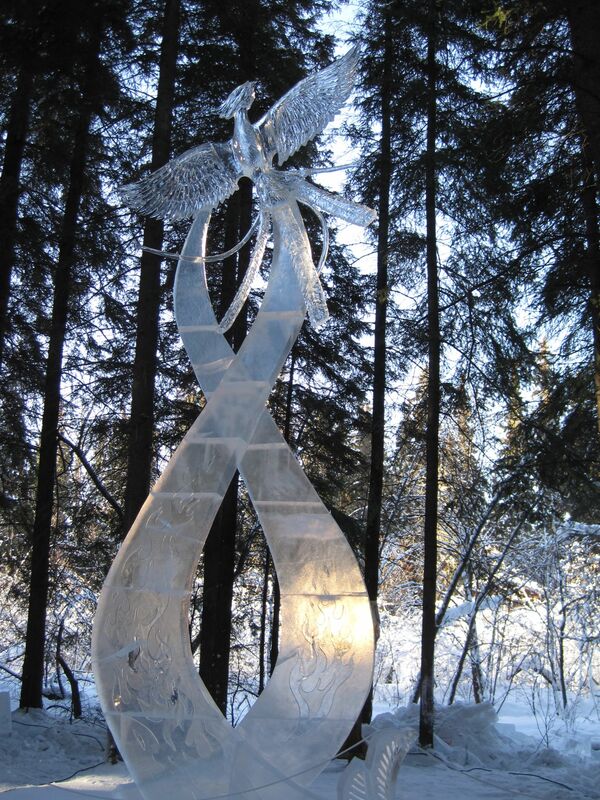 4th Place Abstract was Peaceful Flight, sculptors Stan Kolonko and Jerry Perun, from the United States. 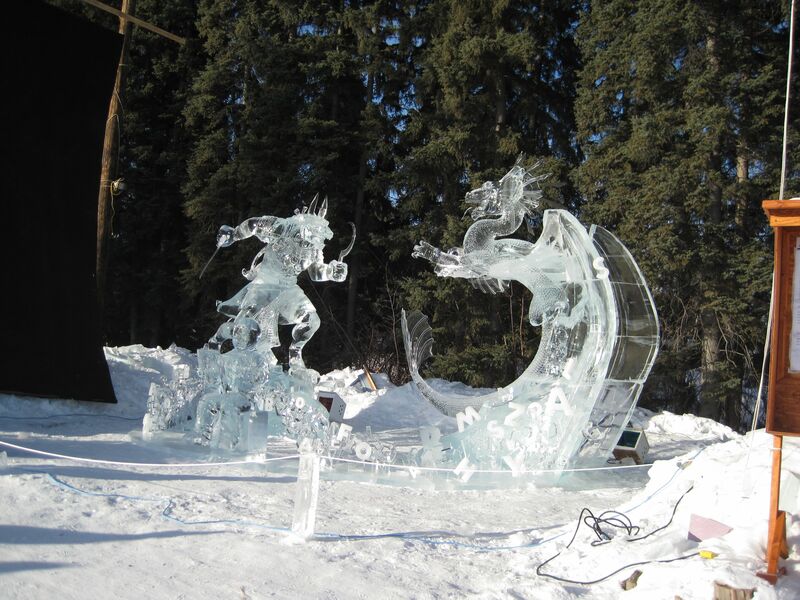 5th place Realistic was Lunch, sculptors Tsagaan Munkh-Erdine and Enkherdene Ganbataar, from Mongolia. 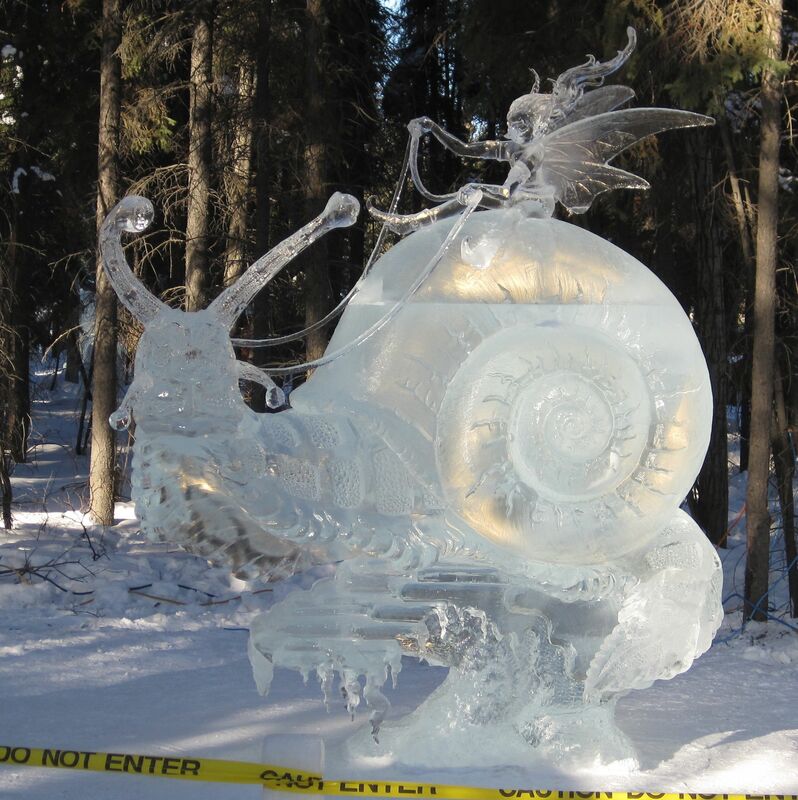 This piece also won Artists’ Choice in the Realistic category. 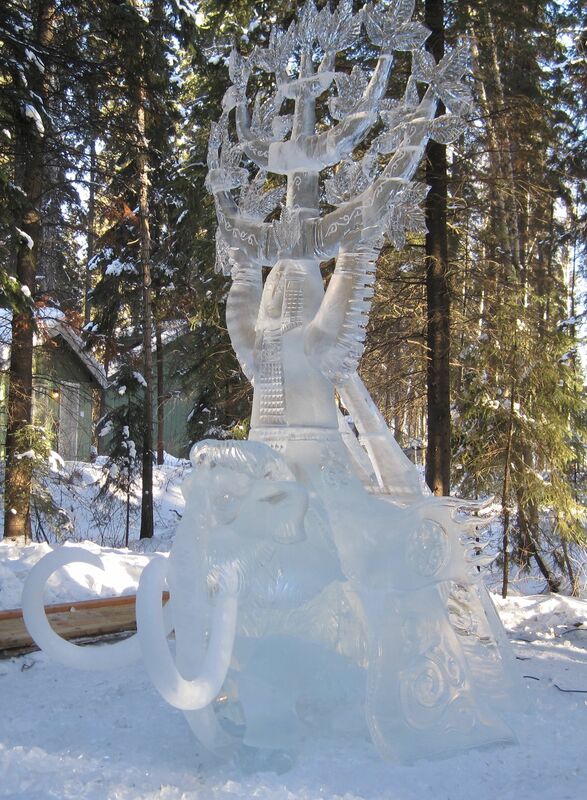 5th Place Abstract was Queen of the Forest, sculptors Igor Stepanov and Alexey Andeev, from Russia. That’s a mammoth she’s riding, by the way. 2nd Place Realistic: Teaching Breaching. 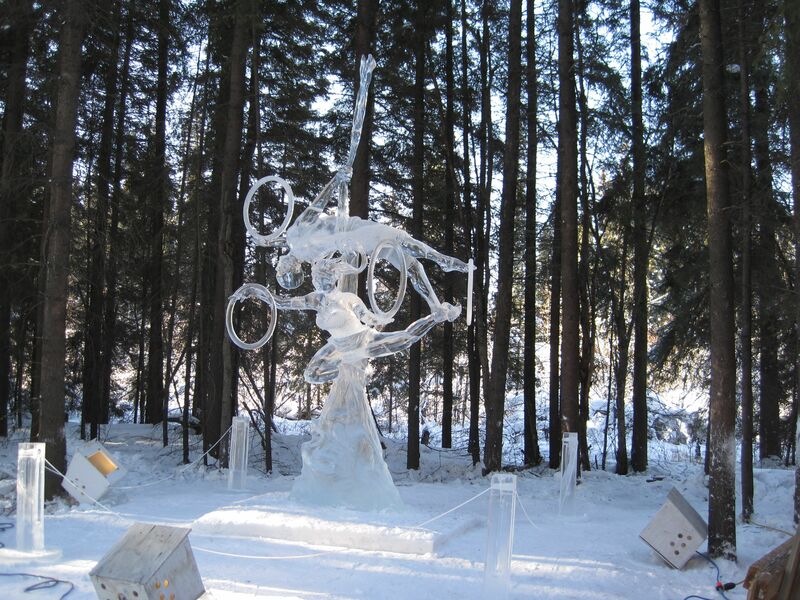 Sculptors Aaron Costic and Stephan Koch, USA. 2nd Place Abstract: Windy Day. Scultors Vitaliy Lednev and Sergey Loginov, Russia. 3rd Place Realistic: Conformity. Sculptors Steve Brice and Heather Brice, USA. There are times I find myself wondering where the dividing line is between realistic and abstract. The sun will rise at 7:52 this morning, and set 10 hours 16 minutes later at 6:11 this afternoon. (Sunrise is in the future tense only because I switched my posting time to midnight.) The sun is getting higher in the sky, too, 18.6° at solar noon, now. With our snow cover and clear skies the past week, sunglasses have definitely been needed! The days are now lengthening by 6 ¾ minutes a day. The roads are still icy; we’ve had some brief thaws, but on all but the busiest freeways it’s merely polished the ice. 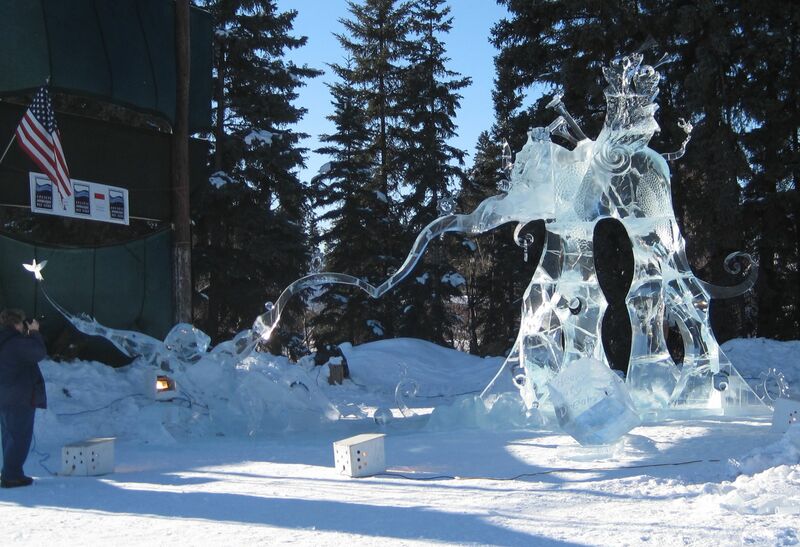 The ice park is open and the judging of the single block competition is complete. The weather has been close to ideal: sunny, with daytime temperatures just below freezing. 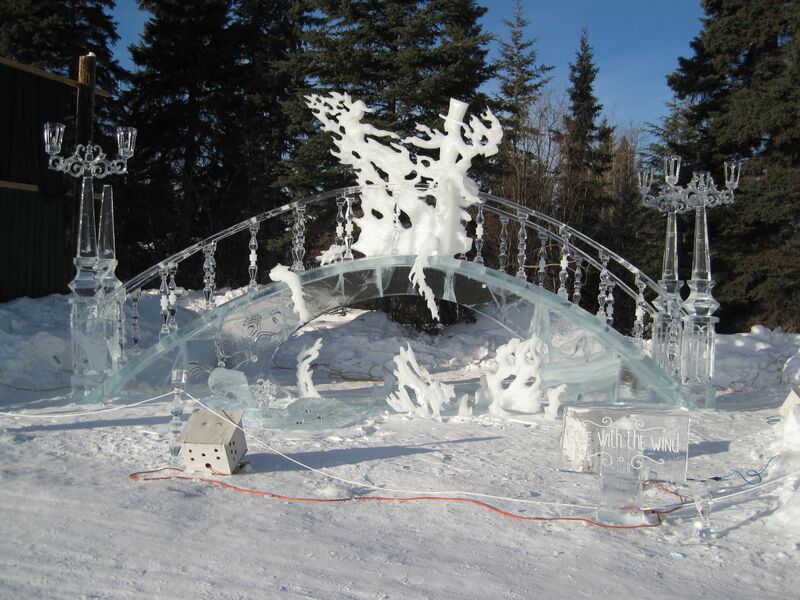 First Place abstract and Artist’s Choice went to Carnival, sculpted by Ivan Zuev and Nikkolay Stepanov from Russia. First Place Realistic went to Love in Motion, by Victo Jagatan and Joel McRae from the United States. I looked at the multi-block area Saturday, a few hours after the sculpting started, but there was too much heavy equipment running around to get much in the way of pictures. I’ll try again this afternoon, after my first iMovie class. 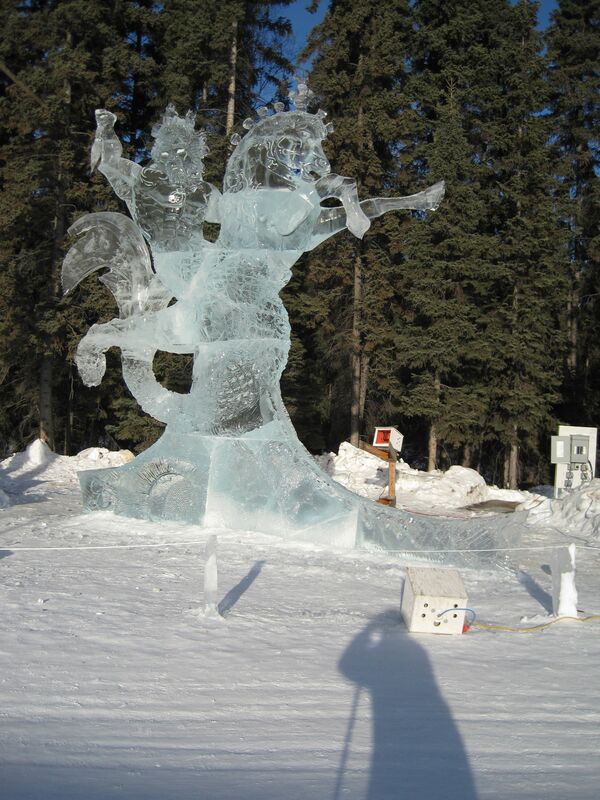 Here are a few photos of the kids’ area from the second day the Ice Park was open. Again, click for full size images. There’s more than one mode of transportation: how about a biplane? 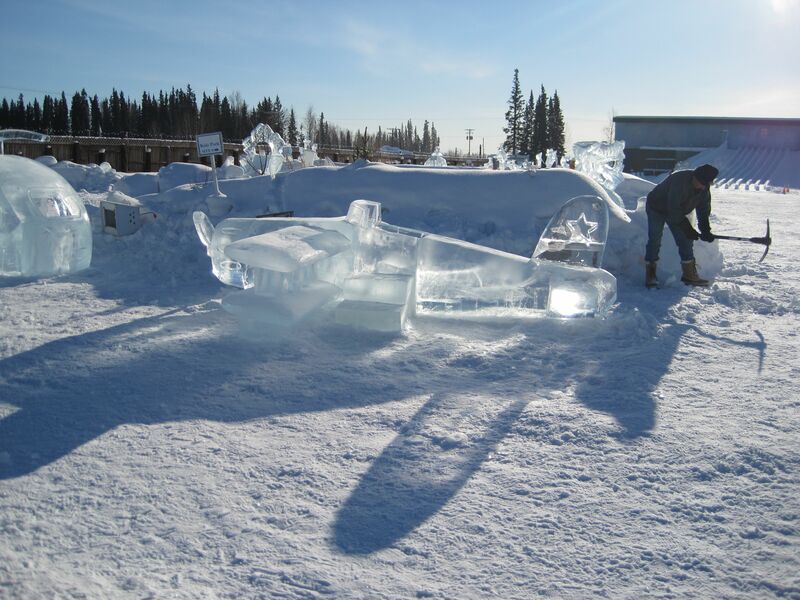 There’s an ice helicopter right in front of the plane. Collision imminent? And one for the adults: a chapel. It isn’t finished yet, but at least one wedding has already been scheduled. A slide with a couple of gorillas guarding it. If you’re looking for the A to Z post, click the logo to the left or scroll down. The sun rose at 7:06 this morning, and it won’t set for 13 hours 39 minutes, at 8:45 this evening. It was 45°F Friday and the streets were wet (and slippery.) We also set a new March record Thursday for the widest daily temperature range: 24 below to 31 above, a warming of 56°F. Spring may really be on the way! “Singing in Unison” as it appeared March 31. The forecasts are calling for more snow now and then, though not much, and with highs forecast for the 30’s I don’t expect much accumulation. The 22” on the ground might even melt a little. I got out to the ice park one last time Saturday (it closes Sunday) and tried to photograph the effects of the warming weather. I didn’t get much, as I had inadvertently set the camera to video. I had to use iMovie and a screen grabber to get the photo to the right. 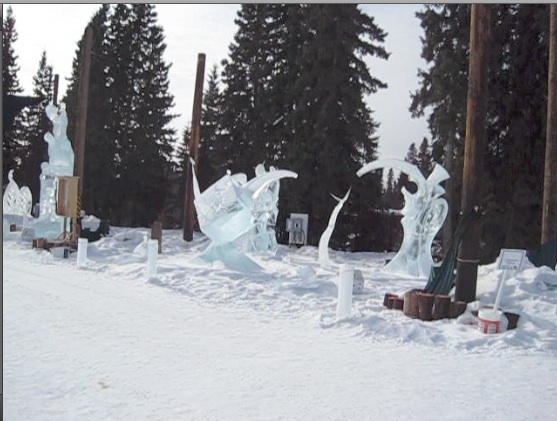 Some of the sculptures have lost their more delicate parts, though most still look surprisingly good for the end of March. The ones out in the open sun, though, have turned from the clear “Alaska Diamond” ice to milky, as the sun has melted the internal grain boundaries of the ice.